Plot: Orin Boyd, a tough cop in an inner-city precinct discovers a web of dirty cops and corruption. Story: Exit Wounds starts when tough police officer Orin Boyd (Seagal) prevents an assassination attempt on the Vice President against orders from his superiors and Secret Service. This loses him his job at his prescient and being sent to a rougher one where new Captain Annette Mulcahy (Hennessy) sends him anger management. When Orin starts investigating a known gangster Latrell Walker (DMX) he is assigned a partner in George Clark (Washington) and the two only honest sounding cops trying to bring him down and uncover the dirty cops in the force. Characters – Orin Boyd is a tough no nonsense cop that will always run in first to do the right thing for people in danger, he doesn’t like dirty cops or criminals or partners and will go all out to bring down the criminals. Latrell Walker is the criminal that Orin is tracking, he is a genius, but not everything about what we learn about him is what it seems on the outside. George Clark is the partner that gets forced onto him, he has a family and just wants to do the right thing but could easily be another one of the dirty cops. We do meet plenty of cops that are dirty through the film, we see many different clichés for the genre in our characters too. Performances – We know what Steven Seagal is capable of as an actor, he can handle the fighting fine, but when it comes to the line delivery he isn’t the best, this is typical for what we know about him. DMX was trying to make an acting career and he does show promise in a time when all musicians seemed to want to get into acting. When we look at the rest of the cast they are what we need in the film without anyone standing out too much, Anthony Anderson gets the funniest moments in the film. Action/Comedy/Crime – The action is short fight sequences, shootouts and chases sequences which are fun to watch with plenty going on through them making the action all we want. The comedy is in small moments and does give a couple of laughs with Anderson being the one with the most. The crime world we enter is everything we know when it comes to corrupt cops which is fine for the film. Settings – The film brings us to Detroit with crime running through it, we know it is generic for crime world, so this works for the film. Scene of the Movie – Seagal versus White sword fighting. That Moment That Annoyed Me – The comedy works, but can takeaway from the main story. Final Thoughts – This is a standard Seagal action film, it is easy to watch and will keep you entertained throughout. Overall: Simple to watch action film. Plot: An undercover cop and a mole in the police attempt to identify each other while infiltrating an Irish gang in South Boston. Story: The Departed starts with the tradition introduction of all the characters starting with Frank Costello (Nicholson) who has been running Boston for years, we meet Colin Sullivan (Damon) who Frank has been grooming to become his connection inside the police force as we watch how fast he rises through the ranks. We also meet Billy (DiCaprio) who has come from the rough side of Boston but become one of the best cadets Queenan (Sheen) & Dignam (Wahlberg) have seen, who talk him into going undercover with the Costello. We follow as Frank Costello and Queenan work with their informants as they each try to keep one step ahead of each other before all of the twists and turns are around every corner. The Departed will go down as one of the greatest crime thrillers of all time, it is filled with plenty of twists and turns throughout. I am not usually a fan of the gangster genre but this one pulled me in from the start to finish because we never knew what would happen next. This was a remake of the trilogy of Infernal Affairs and I can safely say this squeezes all of the action from the three films into one. Each character is developed to keep on interested in all of them as we learn what the real motives are. I can safely say this deserved the Oscar praise it gained. Leonardo DiCaprio: Billy is the special police trainee that gets recruited to go undercover in Frank Costello’s gang. He has come from the rough side of Boston but stayed out of trouble which makes him a prime candidate for this role. While undercover he gets pulled to levels he never thought he would have to go to get his mission complete and stay one step ahead of Sullivan who is tracing him. Leonardo is great in this undercover role showing how he needs to play both sides of the law throughout. Matt Damon: Colin Sullivan is the man who has been working for Costello for nearly his whole life, he is put through the training to become his connection on the inside where he keeps Frank one step ahead of any activity against his men. He also has to track down the men who is undercover in the gang tracking keeping himself away from Billy’s attention. Matt shines in this role of the informant inside the department. Jack Nicholson: Frank Costello is the gangster the authorities are after he runs Boston and keeps his men on the inside while never trusting too many people on the inside of his gang. Jack is wonderful as this gangster playing the role you expect from him and the freedoms he requires. Mark Wahlberg: Dignam is one of the officers that is planting his undercover men in a desperate attempt to stop Costello once and for all. He is direct straight to the point but his temper could also be his weakness. Mark is great as the hot head authority character. Support Cast: The Departed has a huge supporting cast that all give brilliant performance in the plot filled twist filled story. Director Review: Martin Scorsese – Martin finally won his Oscar for this role and yes it is brilliant as he balances the stories from all three Infernal Affairs stories into one. Crime: The Departed is a web of conspiracy between the cops and gangsters in the crime world. Thriller: The Departed keeps us guessing from start to finish through the whole film. Settings: The Departed uses the Boston setting for the film which shows the gritty side of the story. Best Part: Story keeping us gripped. Trivia: The only remake of a foreign film to win an Academy Award for Best Picture. Overall: Simply brilliant crime thriller that keeps us on edge throughout. Ten years has pasted since Sidney (Neve Campbell) survived the last murders. Sidney has since written a book about her experience. Sidney returns to Woodsboro for a book signing with her PR lady Rebecca (Alison Brie). Deputy Dewey is now Sheriff Dewey (David Arquette) he is also married to Gale Weathers (Courteney Cox). Upon Sidney return two students are killed by Ghost Face. Sidney cousin Jill Roberts (Emma Roberts) with her two best friends Kirby (Hayden Panettiere) and Olivia (Marielle Jaffe) get the news along with Jill’s ex boyfriend Trevor (Nico Tororella). Video blogger Robbie (Erik Knudsen) and his partner Charlie (Rory Culkin) complete the school group line up. With Sheriff Dewey in charge he has a new squad of deputies including his new partner Judy Hicks (Marley Shelton) an old school friend of Sidney. The other two we meet are Deputy Perkins (Anthony Anderson) and Deputy Hoss (Adam Brody). Using the ‘Stab’ movies as their reference points to how to make it out the situation the Jill, Kirby, Sidney all stay at Kate Roberts Jill mother and Sidney Aunt. Having a squad car with Perkins and Hoss in are they going to be safe? The list of suspects is good and will keep you guessing all the way. Anyone could be the villain and every corner pushes a different prime suspect before pulling that name straight back off the table. This movie keeps in the same trend of the original trilogy never taking itself too serious and having little pops at all over remakes. Even giving us the updated rules of the ‘Remake’. 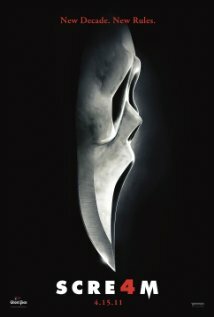 Add in the clever opening sequences puts you on the edge of your seat from start to brilliant revelation on the Ghost Face is. If you like the original movies you will like this fourth as it is same sense of tension through out. Even if your new to the franchise this isn’t a bad place to start up from as the back story isn’t important and what is needed to be filled in gets done in the short filled conversations.